Thanks for your interest in Cel-Fi. This guide will help you understand the character of the brand, its features and aspects to be considered by suppliers or persons related to Cel-Fi who need to make use of it in every situation. The Nextivity logo is the company’s legal name and it is to be used for all legal documents, policies and procedures and internal corporate communications. The Cel-Fi logo is the company’s product logo and it is to be used for all marketing and product communications. Clear space provides breathing room for our logos. It prevents the logo from getting crowded by images, text or other graphics that could lessen its impact and visibility. The Corporate and Product Brand Marks are available in full-color, grayscale and black & white versions, for both positive and reverse treatments. 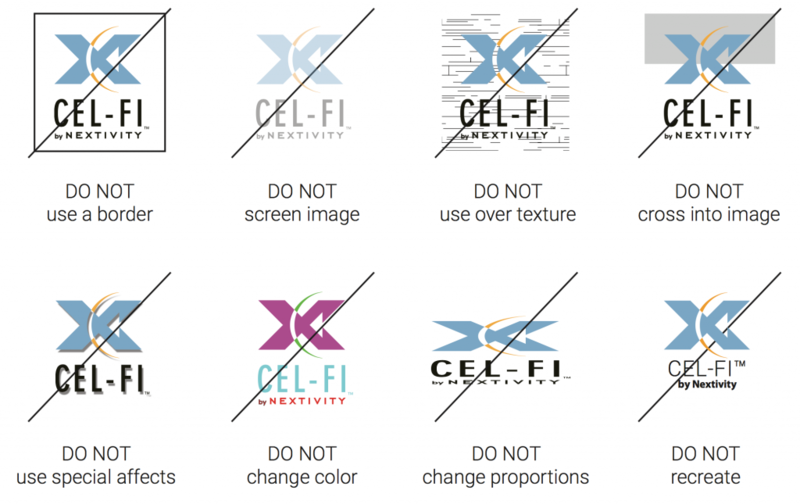 The Cel-Fi logo must be displayed at size, color and frequency with all comparable product marks. This is the preferred use for all Web and Print communications when “by” is 6pt or greater. Standard use for all Web and Print communications. When “by” less than 6pt, do not use. Use for product badges only. The corporate positioning statement accompanies our brand identity. This a single line can be used as a stand-alone sentence, a header or within body text. The logo can be reversed when the background color is darker than 30%. Do not alter the logo an any way. Our typeface has been selected for its clean, modern and precise lines. Roboto was designed for mobile, web and print usage and is the default font on Android phones. Roboto Condensed is a narrower font and should be used for all headlines and titles. Roboto is wider and this makes for a more natural reading rhythm and is prefect for all body copy. The naming of Nextivity’s product line consists of the product logotype combined with the product name. Logotype = Geometr706 BdCn BT. Height = 33% of the product name. Product name = Geometr706 BdCn BT in all caps. Nextivity developed industry leading technology with additional branding. The chipsets and underlying software create unique solutions that optimize cellular performance, while remaining completely Network Safe. The corporate line art can be used to describe features of Cel-Fi. These graphic patterns can be used in marketing and corporate communications. How do I use a trademark properly? 1. ALWAYS distinguish a trademark from surrounding text by using it in all capital letters (or, at least, with initial capitals); by using it in a bold, italic or underlined font; by placing it within double quotation marks (“ ”); or by using it in a stylized or graphic form that differs from the surrounding text. If the trademark is registered, use the superscript ® symbol or other appropriate registration notice. For US, use the ® and for non-US use the™. 2. ALWAYS use the trademark consistently, including with or without spacing and/or hyphens. 3. NEVER use a trademark as a noun. Always use a trademark as an adjective modifying a noun. 4. NEVER use a trademark as a verb. You are NOT Cel-Fied; rather, you are connected with Cel-Fi™ solutions. 5. NEVER modify a trademark by changing it to the plural form. 6. NEVER use a trademark in the possessive form unless the trademark itself is possessive. 7. How do I use trademarks online properly? Use of a trademark in text online generally is no different from use of a trademark in print. Certain uses of another’s trademark, however, such as in domain names, in metatags, as wallpaper on a website or as a keyword purchased from a search engine, might subject you to legal liability.